Please join us for our 2019 Spring Break Camp! This is a great opportunity for boys and girls ages 12-18 to learn all of the basics of the sport in a fun environment with our rowing coaches. Many of our athletes who have gone on to row in college took their first rowing strokes at one of our camps! It is a fantastic introduction to the sport and there no better place to give it a try! A number of you have asked what clothing should be worn at camp. Your rower should come prepared to exercise with running shoes, shorts and a T-shirt. Baggy shorts and shirts should be avoided to prevent interfering with the oar handles and seat tracks. Those campers missing signatures or forms, can complete the information during camp check in. Registration and payment may be placed in the boathouse mailbox or mailed to the LBJC PO Box. Space is limited, so please sign up now! 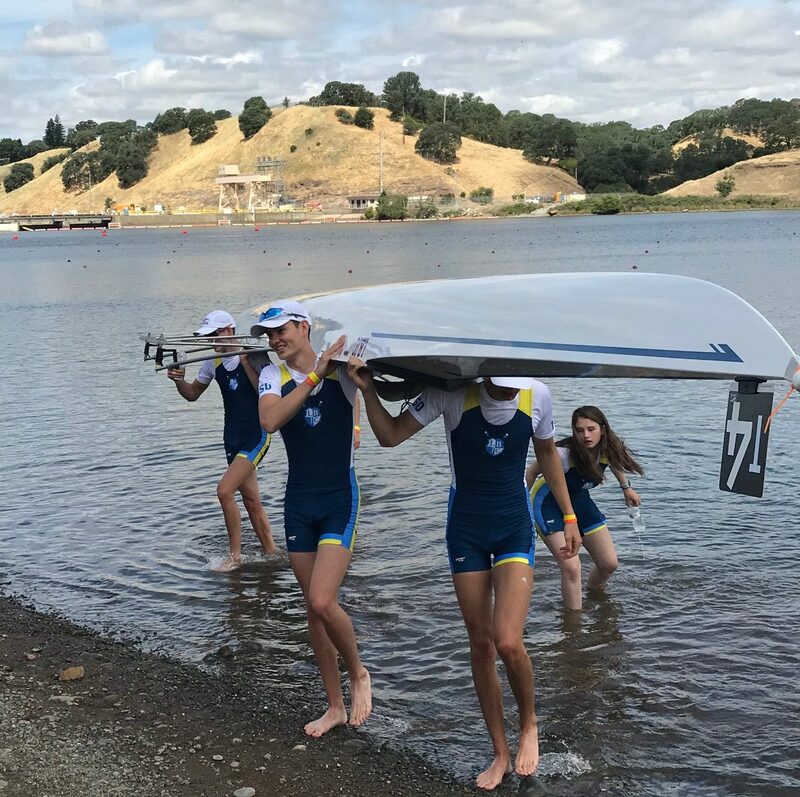 Long Beach Junior Crew competed at the 2018 Youth National Rowing Championships in Rancho Cordova, California on June 8th – 10th just outside Sacramento. 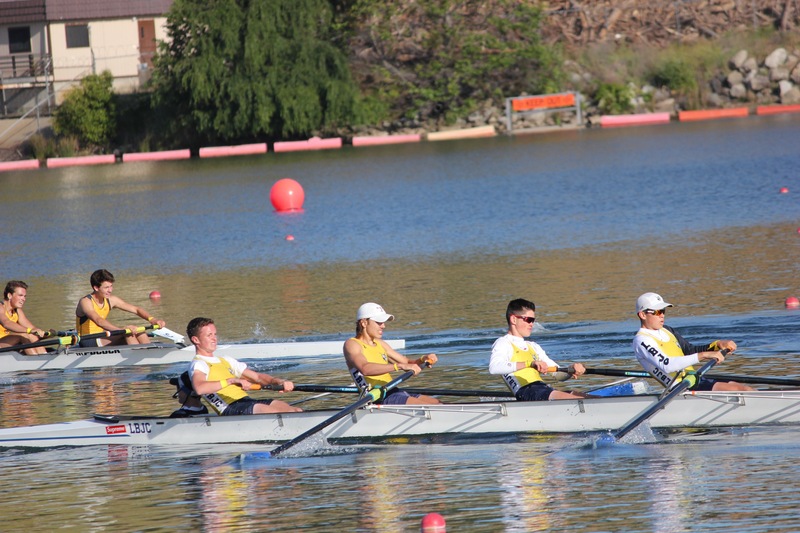 In order to qualify for this regatta, crews from all over the country had to place Top 3 in their respective regions. More than 1,500 athletes in 350 boats from 150 teams qualified from 12 different Regional Qualifier Regattas. 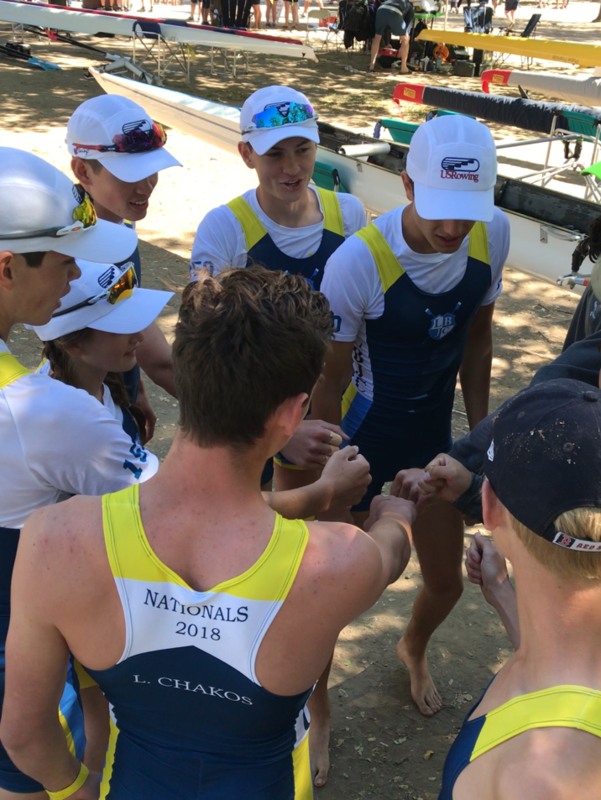 In addition to those athletes, there is a petition process that allows a select number of deserving crews that finish outside of the top 3 to still compete at the Nationals. 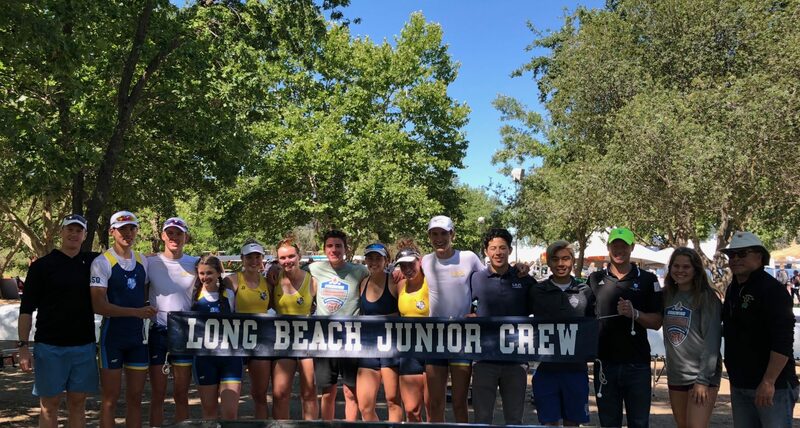 Long Beach Junior Crew qualified 3 boats for Nationals at the Southwest Junior Regional Championships- the Lightweight Men’s 2x, the lightweight Men’s 4+, and the Women’s 4x. 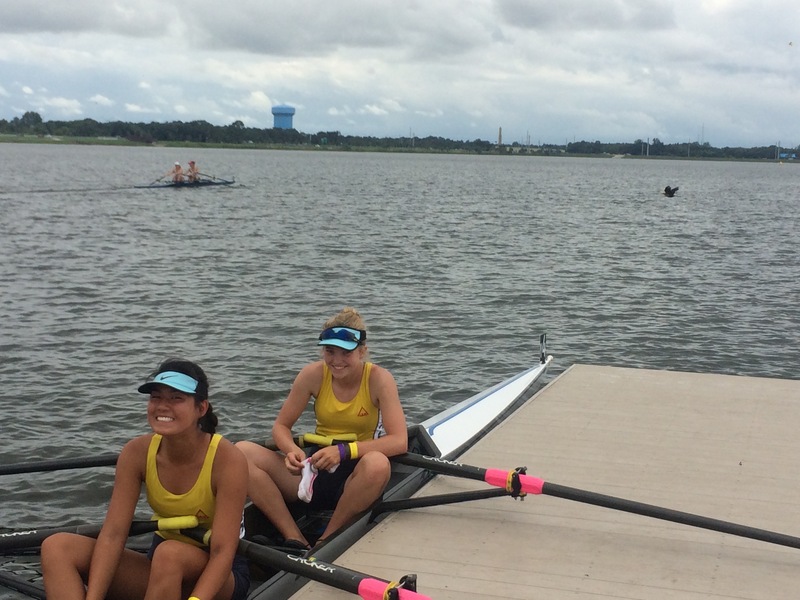 In addition, we put in a petition for the Women’s pair who (after catching a crab) finished 4th at regionals. The Committee accepted their petition 9 days before the start of the National Championships. Lucky for us, the girls had already been training hard for several weeks. The team arrived at the course on Wednesday, two days ahead of the start of the regatta. We had ample time to rig, practice and get set up to race. There was a tremendous amount of positive energy on our team. The athletes had trained to the absolute best of their abilities and over 5 weeks and were extremely excited to finally race the best in the country. 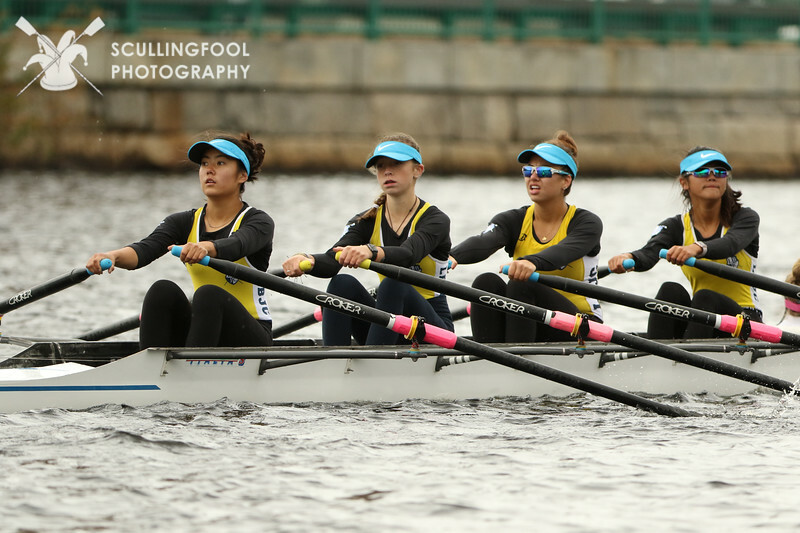 The format for the regatta was Time Trials on Friday, Semifinals on Saturday, and Finals on Sunday. In the time trial, every boat in the event would race down the course one by one. The Top 8 crews would go directly to the Semifinal. The rest of the boats in each event would go to a Repechage later Friday afternoon. From there the top 4 boats would go to the 12 boat semi final, the rest of the boats would either be eliminated or go to a C final. In the Semifinal the top 3 crews from two semifinals would advance to the A Final and get to race for the medals, and the rest to the B Final. With about 20 of the top boats nationally in each event assembled, there was no room for error in the time trial. Amazing, all four of LBJC’s boat advanced DIRECTLY to the semi-final. 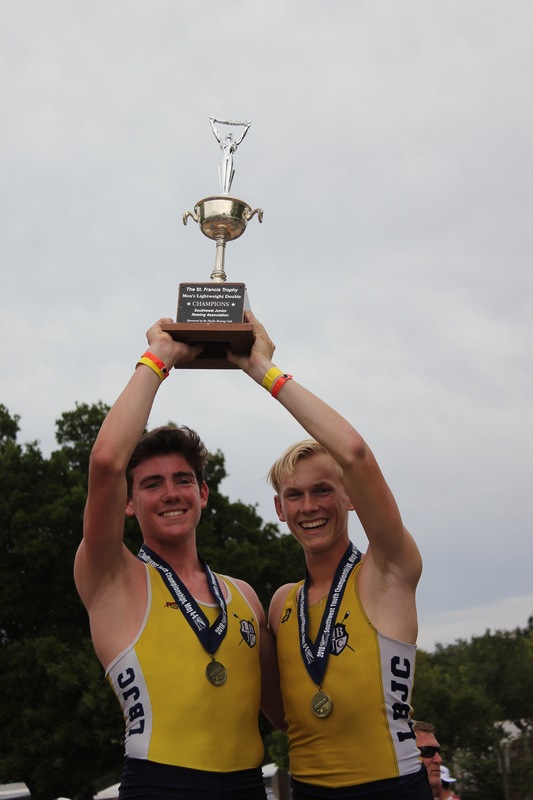 The men’s lightweight double and the women’s pair led the charge both finished in second place, less than a second off of the leader. The men’s lightweight four finish in 7th place and the women’s quad finished in 5th place. Having all of our boats avoid the repechages later that afternoon was a huge success. An extra race in the hot afternoon sun is definitely not the easiest route to the final. Our hard work and good performances allowed us to stay cool and refuel for the semifinals the next day. To give you an idea of the level of completion, in the women’s pair for example- only one out of the three medalists from our southwest regionals moved on from the time trials. This regatta is incredibly competitive. 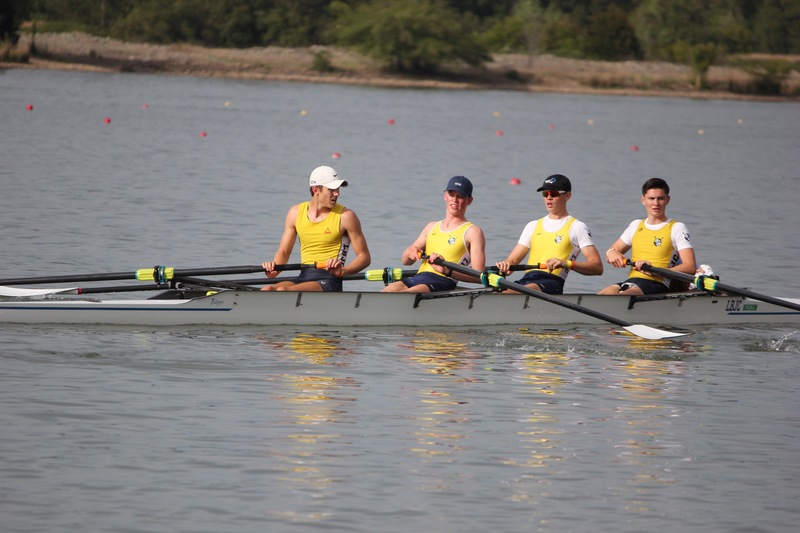 On Saturday morning, our four boats had challenging semifinals ahead of them. Conditions we fairly good with a building crosshead wind from the south. First down the course was the women’s pair. Annika Maxson and Brooke Campbell looked very strong winning their semifinal by a bit of open water in a time of 8:06. 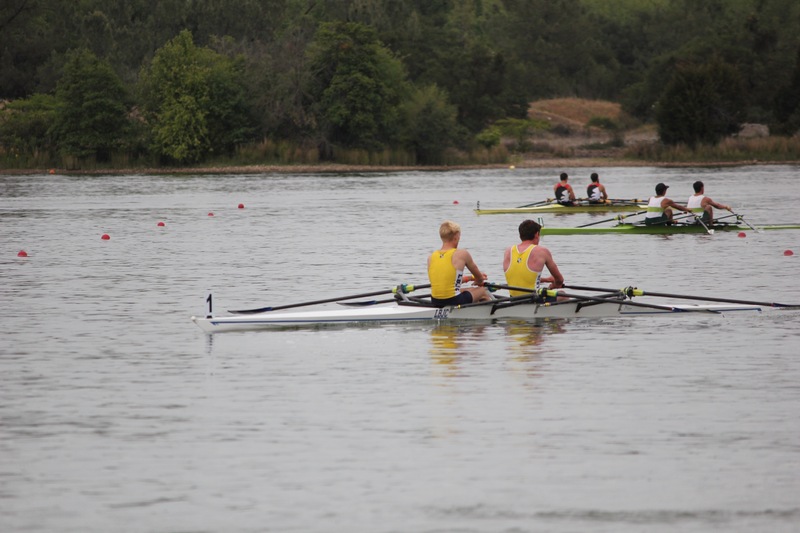 The Texas Rowing Center pair won the other semifinal with a time of 8:01. In the men’s lightweight double, Logan Chakos and Zach Freidrichs led wire to wire in their semifinal, winning by just under a second over Parati Rowing from Texas. In the Lightweight Men’s Four, Trent Francia, Jack Love, Tibor Francia, Tyler Francia, and coxswain Tess Nemnichhad an amazing race. 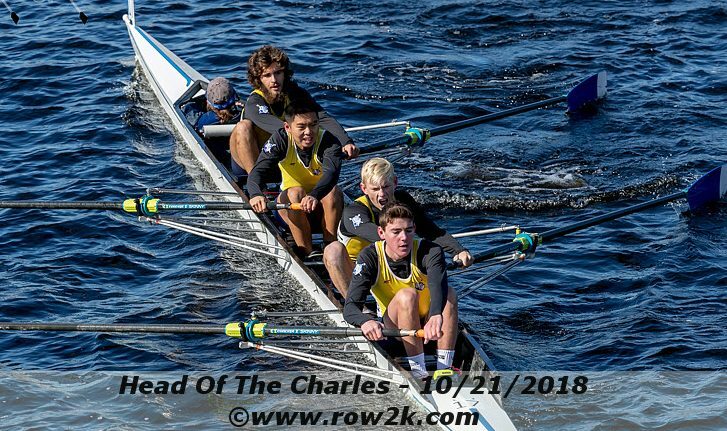 Sitting in 4th position almost the entire race, the “Triplets plus Jack” began reeling in the field during the last 500m and during the last 250m they raised the rating into the mid 40’s (VERY HIGH) blowing right past Belen Jesuit (Florida) to snag the final spot in the A final. Amazing. Finally, the Women’s quad of Alex Benson, Danielle Hoekstra, Brooke Campbell, and Annika Maxson had a hard fought race, gradually pulling away from GMS (Connecticut) and finishing in third. With that race complete, LBJC officially had all of our boats qualify for the A final securing a top 6 finish, a tremendous accomplishment. The team spent the rest of the day relaxing at the movie theatres, having our last team dinner, and some even caught a great sunset. The team was ready to go. Our first race on Sunday morning was the women’s pair. In an extremely impressive piece of rowing, Brooke and Annikatook control of the race from the first stroke. After the first 500m, our girls had one length lead on the field and by the halfway mark they extended it to two lengths. Brooke and Annika rowed fearlessly. For the rest of the piece, the pair from Texas chased LBJC. Brooke and Annika continued to hold onto their margin and in doing so both boat pulled away from the rest of the field significantly. Our LBJC girls crossed the line in 7:55 about a length ahead of Texas and 10 seconds ahead of the next boat. It is amazing to think that these girls finished 4th at Regionals, petitioned the boat for nationals, and came away with a dominating performance leading from wire to wire in the final. Incredible stuff and a well deserved National Championship! In the Men’s Lightweight Double, Logan and Zach were undefeated going into the final. In the first part of the race, the guys had some unfortunate luck and snagged a buoy, which put them behind early. The guys struggled to find their fast, easy rhythm after the mishap. In a field with the six fastest boats in the country, even the fastest boat (like we believe ours is) will have trouble catching up without their best race. Our guys rowed hard all the way to the line and finished in 5th place. 5TH in the country is a tremendous accomplishment, but certainly does not feel as good when you believe that you are capable of winning the race. Both of the guys are juniors and will no doubt be able to use this race as fuel for next year! The next final for LBJC was the Lightweight Four. Trent, Tibor, Tyler, Jack, and Tess had done very well to make the final. They were sitting in 6th place most of the race. With 500m to go, LBJC was open water down to 5th place. By now we all know that these fellas have an incredible sprint, but this was easily their most impressive to date. They brought the rating above 40 with 500m to go and started reeling in 5th place. As all of the other boats started sprinting, our guys went up even higher- to a rate of 48 this time! If you get a chance, you should watch the video at around 1:02:00 in to the video at this link: https://www.youtube.com/watch? v=6Ny4DOTiVQc All of the boats in the final were sprinting full blast and our guys were melting the field. They moved into 5th place but they weren’t done. In the final 10 strokes of the race, they sprinted through longtime rival and Southwest Champion, Newport, and came across the line in 4th place. The announcer did not even mention Long Beach because we came out of nowhere; it wasn’t until after the race that they confirmed our 4th place position. Incredibly, the guys finished only one second out of a bronze medal! While it is bittersweet getting 4th place, we are incredibly proud with how they raced. They put their best race together when it counted . Phenomenal effort! The final race for LBJC was the Women’s quad. Brooke and Annika had their pair final less than two hours earlier and were now back on the starting line with Danielle and AlexBenson. At regionals our quad was in last place off of the start, so we had worked hard over the last 5 weeks to improve that part of the race. 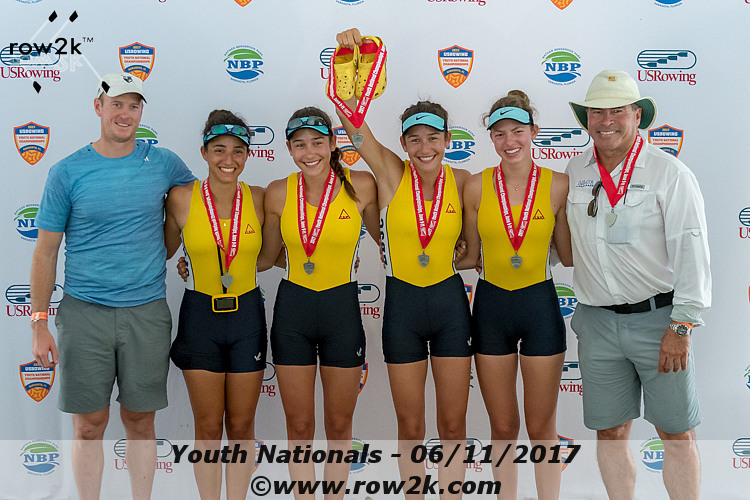 It seemed to pay off as our girls rocketed off the start and put themselves into third position in the nationals final. The entire way down the course LBJC battled Connecticut Boat Club for third position. In doing so they pulled many lengths ahead of regional rival Newport. In the final 500, Connecticut raised their rate and tried to charge ahead, but our LBJC girls continued to respond and hold off their attacks. LBJC finished in third to win bronze, our second medal of the regatta! Well rowed ladies! By all measures, LBJC had a very successful National Championships. Our athletes demonstrated an amazing amount of dedication and focus in the 5 weeks of preparation between Regionals and Nationals. It was great to see the guys and the girls teams working together during training. There was a tremendous sense of unity and camaraderie between all the athletes, coaches, and parent chaperones. There is no doubt in our mind that this fun and positive environment largely contributed to our team’s successful performance. This group in particular was filled with great attitudes and personalities that made it truly an honor to be a part of. A week later, looking back on the results we can say that we are incredibly proud and pleased with the hardware we brought home. However, the real story is that we had all four of our boats in contention for medals. That is incredible. We were very close to bringing home more medals than any club in the country. No matter how well one prepares, there is always an element of luck to every successful performance. Sometimes it goes your way and sometimes it doesn’t. Our 4 boats experienced the entire range, but one thing is certain, we were well prepared for the opportunity! Heck of a season. Well Rowed and GO LONG BEACH! Thank you to Row2k.com for many of these photos. 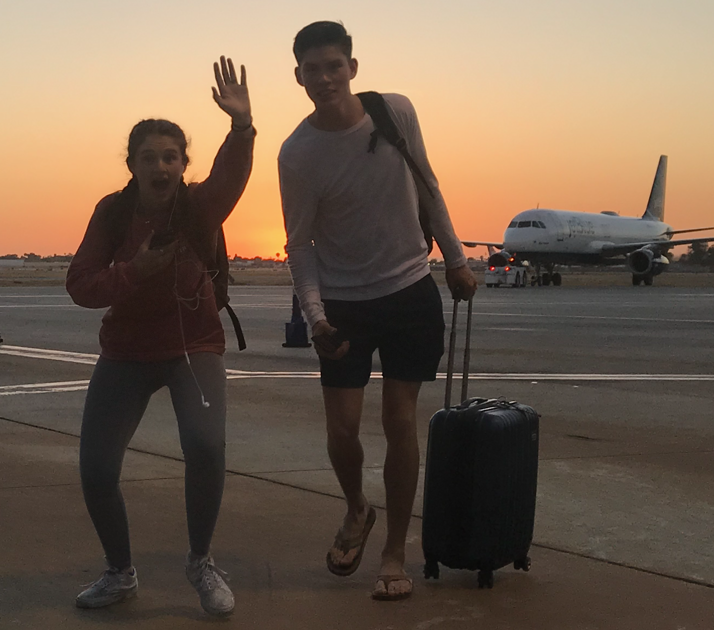 Posted in Uncategorized	| Comments Off on 2018 NATIONAL CHAMPIONS! 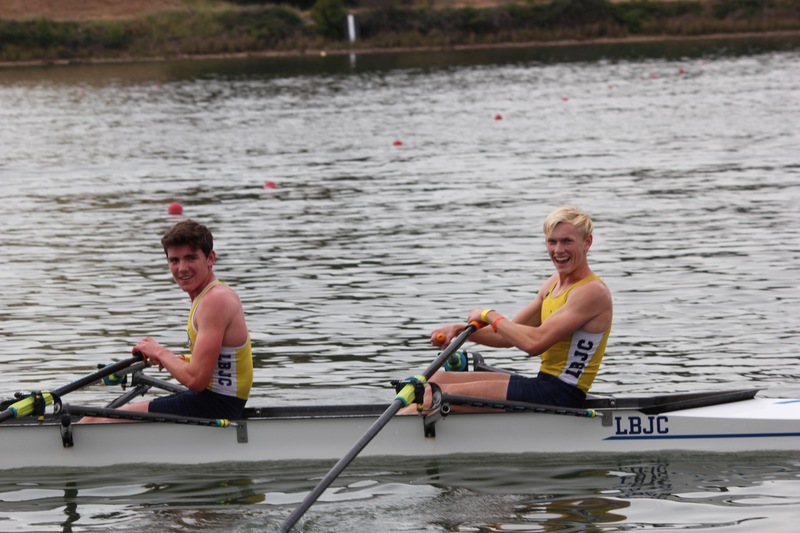 The LBJC team competed at the Southwest Regional Youth Rowing Championships in Rancho Cordova, CA last weekend. 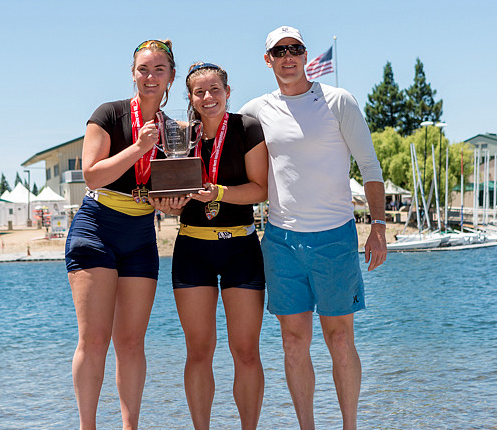 The event is a large three-day regatta that serves as the regional championship and draws crews from many different states, but predominantly from California. The regatta is the end of our regular season and is the final championships for Novice and JV crews. 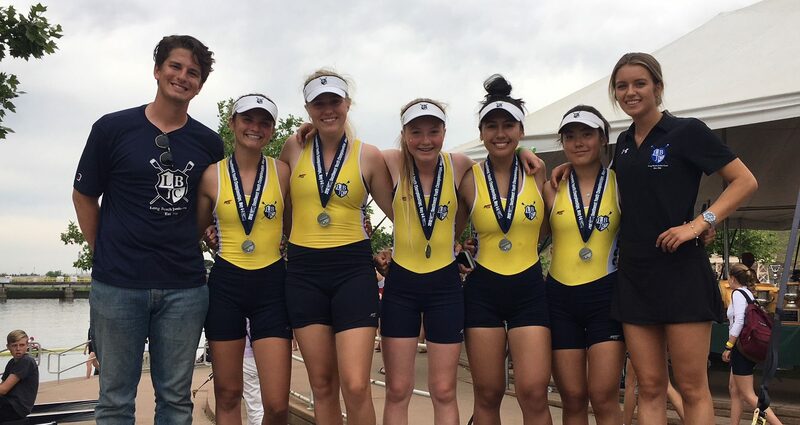 However, for varsity crews a top three finish earns them not only a Southwest Regionals medal but also an invitation to compete at the National Championship in early June. Needless to say, the level of competition at this regatta is very high, not to mention the Southwest is the most competitive region in the country. We had great racing all around from the team. As is true with all racing, we had some races go our way and some that didn’t. For instance our Men’s Varsity B 4x missed advancing out of the time trial by less than a second, but the Men’s varsity 2x snagged the last qualifying spot for the semi final by 0.3 seconds! There were plenty of instances like this throughout the weekend. Hard fought racing all around and everyone should be proud how our team raced and handled the ups and downs of it all. The weekend was highlighted by a few special performances from our team. Our first medal performance of the weekend was the Novice Women’s Coxed Quad (4x+) of Hannah Nemnich, Lauren Brandmeyer, Ashley Retzer, Evon Nakamine, and Ella Van Fleet. The novice girls were engaged in a two-boat battle for the lead all the way down the course well ahead of the rest of the field. The girls finished in second place over 10 seconds ahead of the next boat. Next up was the Men’s Lightweight Double (2x). The combination of Zach Friedrichs and Logan Chakos has been undefeated all season. In an impressive display of sculling, our two guys led from start to finish and crossed the line 14 seconds ahead of the next boat. You could see that these guys were not racing the other boats; they were just hitting their rhythm and fully enjoying making the boat sing. It was awesome to watch and we are looking forward to seeing these guys at Nationals. On Sunday morning the team had a few more boats in finals. Leading off the charge was the Women’s Quad (4x). 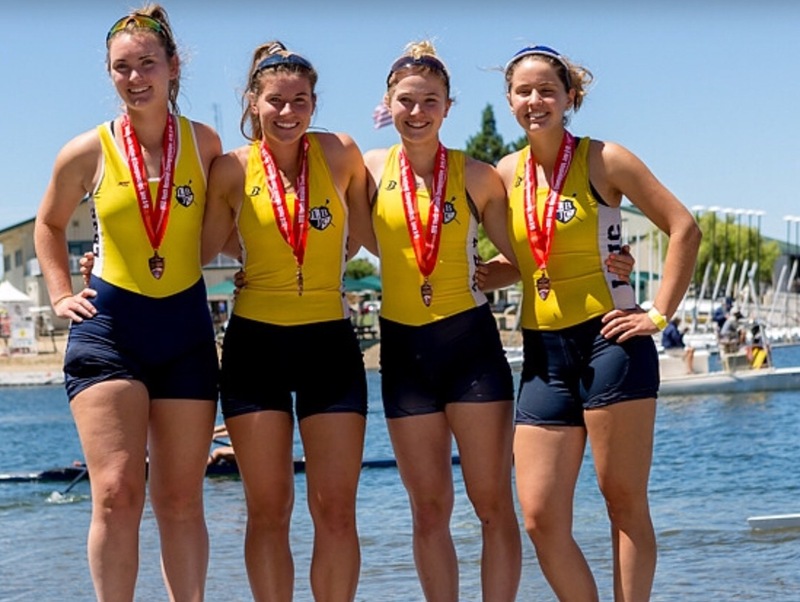 Annika Maxson, Brooke Campbell, Danielle Hoekstra, and Alex Benson were rowing in 4th place nearly the entire race, out of the medals and nationals. The field was very tight between CYC, Redwood, LBJC, and Newport. With 500m to go, the girls started gaining steam and moved on the other boats and into medal position. With their inspiring last quarter of the race, the girls finished in second place earning silver and a bid for the National Championship. Less than an hour after this race, Brooke and Annika were back at the starting line for the Women’s Pair (2-) trying to pull of the improbable feat of qualifying two boats for nationals in under an hour. They had done well to move on through the time trials and semis in both events. When they were coming down the course in the W4x final, their competition for the pair final was already warming up on the water. 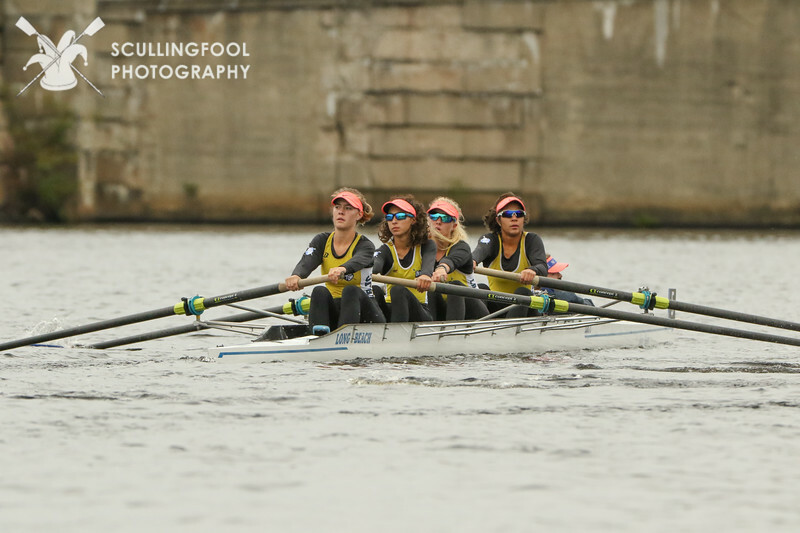 The girls blasted off the start and were in contention for the lead at 300m into the race when one of their oars clipped a buoy and as a result they swerved lanes and came to a stop. They got themselves pointed and back up to speed but were now in last place. They were the fastest boat on the course for the next 1700m. The girls rowed incredibly fast moving back into the lead pack in the last 250m. It was incredibly close at the line. Ultimately, they finished 4th, 3.5 seconds (1 length) back from 1st place and painfully 1.1 seconds back from 3rd place. Truly an incredible performance. Our last final of the morning was Men’s Lightweight Four (4+). This is another boat that is fun to watch because of how aggressively they row. “The triplets and Jack” is how we refer to them, but the actual line up is Jack Love, Tibor Francia, Trent Fracia, Tyler Francia, and Tess Nemnich. In a competitive field, two boats established a substantial lead from the rest. They fought for the lead all the way down the course and finished in second place, 3.5 seconds behind first and over 6 seconds ahead of 3rd. With their silver medals and a National Championships bid, it’s nice to know that we have not seen the last of Team Francia. 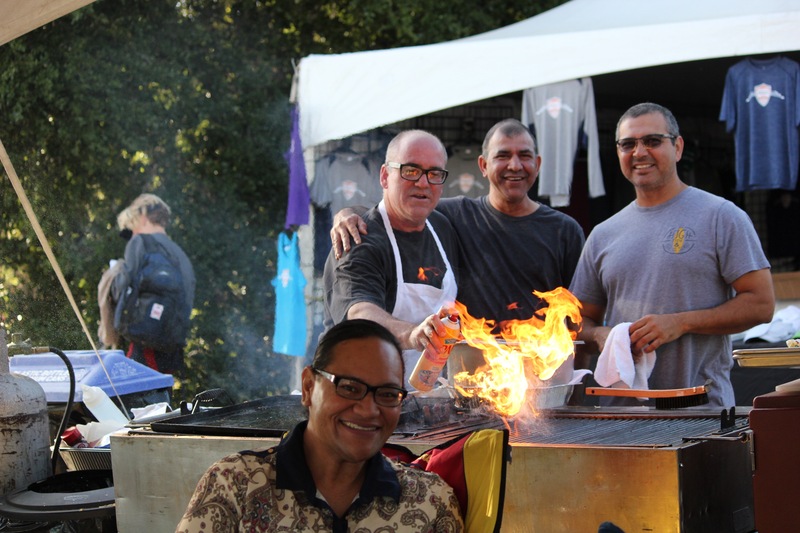 A big ‘thank you’ to our parent volunteers that chaperoned the trip and cooked amazing food at the hospitality tent. If there were a hospitality event at regionals, our parents would have a gold medal and would be on their way to nationals! 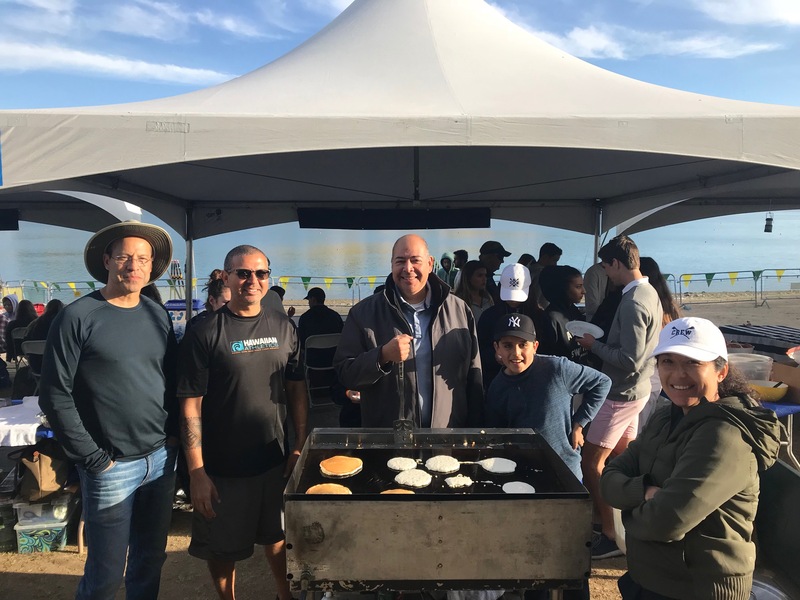 Pancakes and Tri-tip, need we say more? You guys were amazing. THANK YOU! Winter camp starts on Dec. 26 and goes until Jan.5 (Tuesday – Friday) from 8:00am until 12:30pm. The camps are for boys and girls ages 12-18. Space is limited so please sign up now! 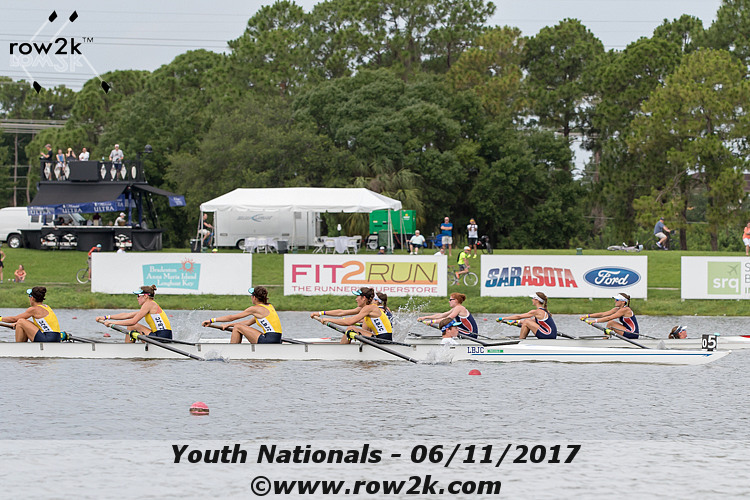 Long Beach Junior Crew had 22 athletes travel to Sarasota, Florida on June 9 to compete in the U.S. Youth National Rowing championships. 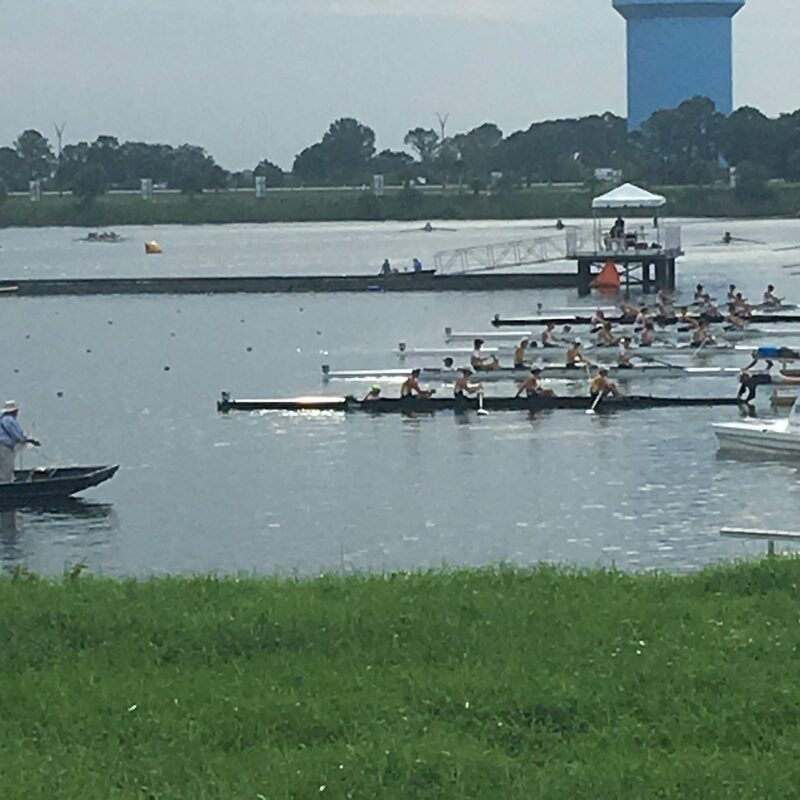 Each crew competing at the national championship regatta had qualified for the event by finishing in the top three places at one of six regional championships held all over the country. We were entered in three events: the women’s lightweight double sculls (WL2X), the women’s quadruple sculls (W4X), the men’s lightweight four with coxswain (ML4+), and the women’s lightweight four with coxswain (WL4+). The team was greeted with hot and humid weather with a heavy dose of afternoon thunderstorms, quintessential Florida weather. The regatta began the morning of Friday June 9 with time trials for all boats. The format for this race was that the top 12 boats would go directly to the semi-final and the rest of the boats would go directly to either the C final (places 13-18) or D f inal (places 19-24). All of the boats competing at this regatta have medaled at their respective regional championships. Needless to say, the competition is extremely good. There are no easy races. Every placement at this regatta is earned with real determination and high caliber racing. In the time trials, three out of our four boats finished in the top 12, but unfortunately our Lightweight Women’s double finished in 13th place. 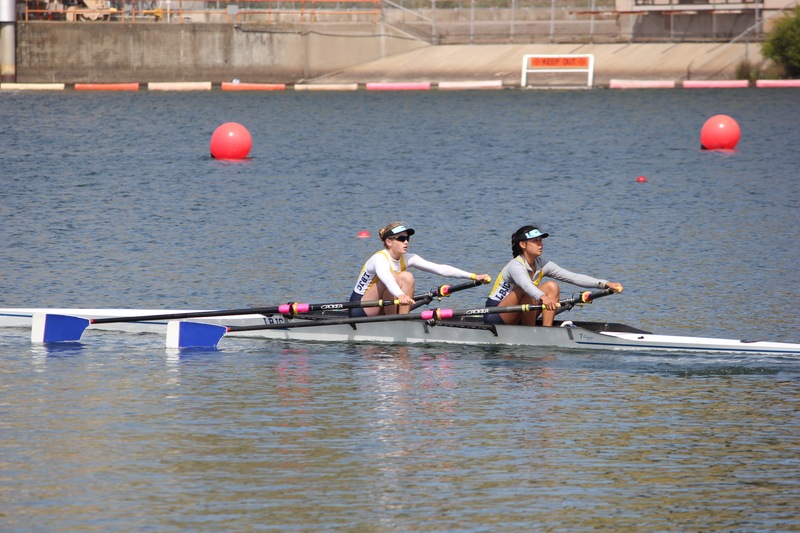 Our LW2X, comprised of Amanda Yap and Danielle Hoekstra, missed qualifying for the Semi Final by a mere 0.2 seconds. That margin is especially painful considering the girls snagged a buoy in the last 100m of the time trial, slowing them down by well more than 0.2 seconds. 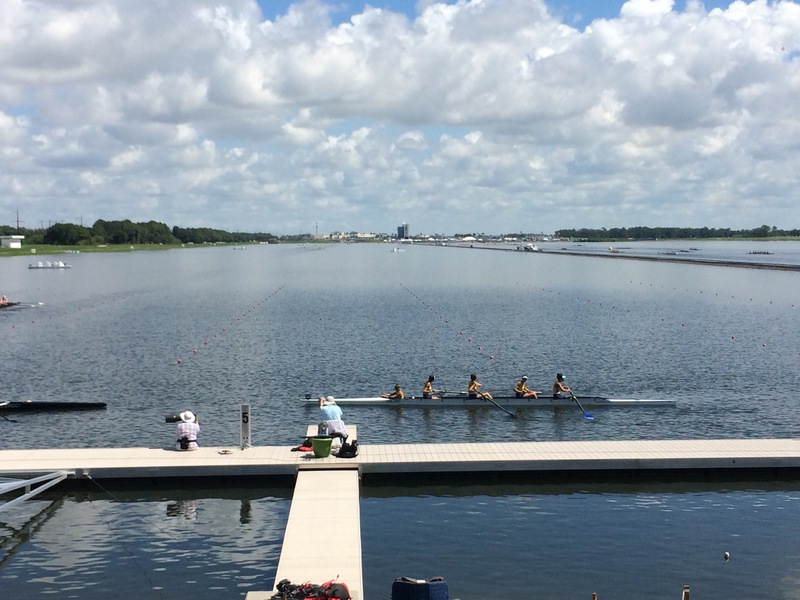 On Friday afternoon, LBJC had the semi-finals for the Men’s and Women’s Lightweight Fours. The Varsity Men kicked off the afternoon with a great race in the semi. They needed to place top 3 to make the final. They established themselves solidly in 2nd place during the second thousand, which qualified them for Sunday’s final. In the WL4+, the girls rocketed off the start and had nearly a one length lead at the 500m mark. Through the middle thousand meters of the race, two boats began to chip away at Long Beach’s lead. Going into the last 500m, the girls had probably a ¼ length lead over Holy Names Academy. That’s when our girls turned up the heat. Their rating surged and the girls were able to extend their lead to ¾ Length at the line. They had the fastest time of the day; 7:32, 2.5 seconds ahead of the next crew. 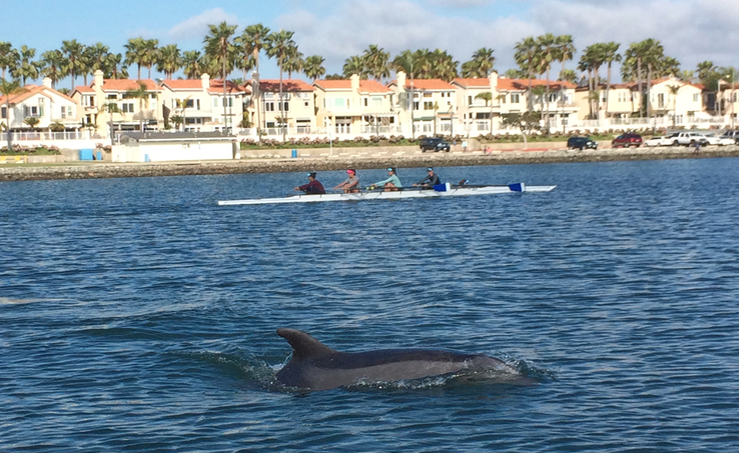 On Saturday morning, Long Beach was lucky enough to get their races in before the big thunderstorms and high winds rolled through and cancelled the rest of the racing for the day. 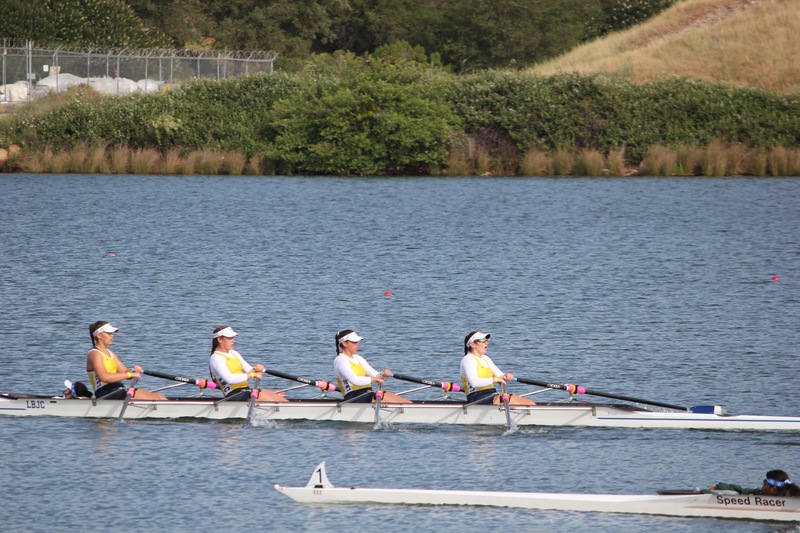 The LBJC Women’s 4x raced their semi final. The line up from stroke to bow was: Zoey Chakos, Annika Maxson, Helena Young, and Siobhan Quirke. There were 4 crews battling for 3rd the whole way down the course. Our girls were a length out of qualifying (top 3) with 750m to go. Unfortunately we were on the wrong end of that battle and finished in 6th place. 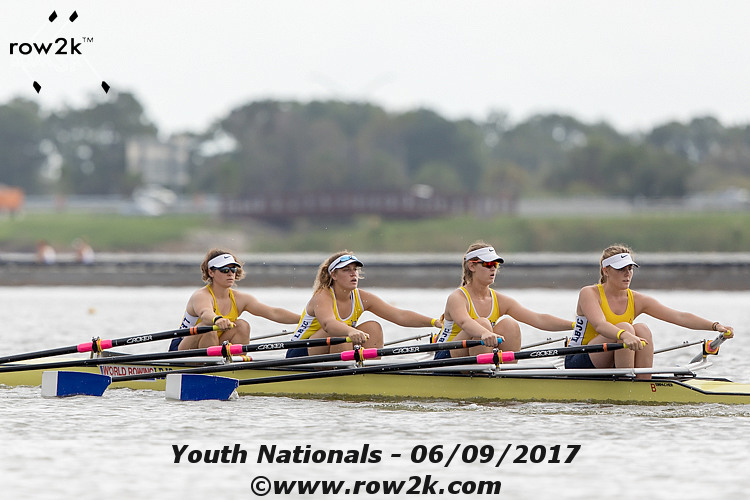 It was a solid and aggressive race for our girls considering how close we were to CYC who had won our regional championships. The next race was the “C Final” for our Women’s Lightweight 2x. The girls looked great rowing wire to wire at 36 strokes per minute ahead of most of the field. Unfortunately, the Redwood Scullers boat slipped away into first place and we ended up with a solid 2nd place in the C final, which is 14th place in the country. I know everyone on our team that made the trip to nationals trained with the highest expectations of performance. We believed a medal could be within our grasp, but this was simply not our regatta. So while there may be a feeling of disappointment after this race, 14th in the country is an incredible accomplishment and we are very proud. Holding ourselves to the highest standard, giving our best performance, and holding our heads high regardless of the outcome are what LBJC is all about. The next day the team was at the course early to weigh in for the A finals of the lightweight men’s and lightweight women’s 4+. This was an entire year of training all coming down to one 7-minute race. Both boats looked ready to go, confident and nervous all at the same time. The most nerve-wracking part of the sport is the final half hour leading up to the race. As a rower, you have rehearsed it hundreds of times. There is nothing left to do other than go through the motions of the race warm-up with your mind firmly set on giving everything you have when the flag drops. (or in this case when the light turns from Red to Green). Our Men’s Lightweight 4+ was up first. 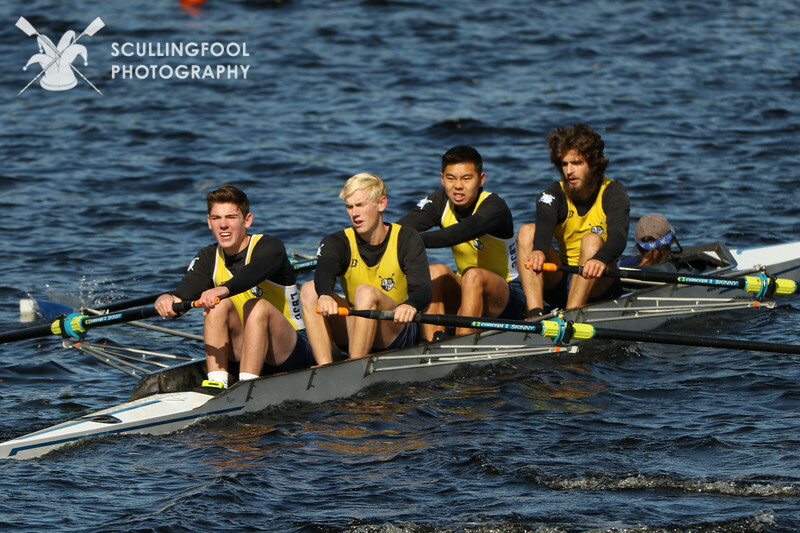 The line up from stroke to bow was Tibor Francia, Trent Francia, Jack Love, Logan Stockwell and coxswain Dillon Wilson. Unlike other junior races, this race course uses a ‘light system’ for the start instead of the Referee using a flag to start the race. 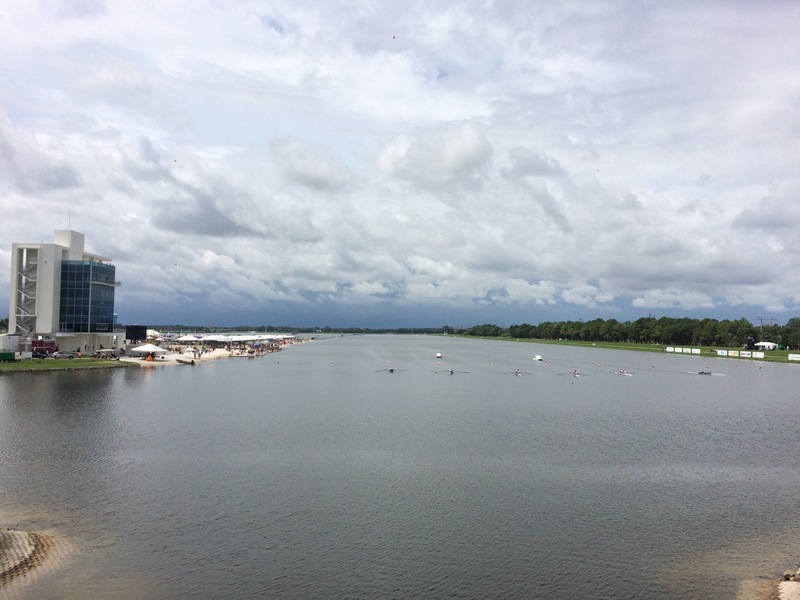 The Sarasota course will host the 2017 World Rowing Championships so everything on the course is up to Olympic specification including the starting platform and the seven-story finish line tower. Whether it was a malfunction of the light system or just a pure mistake, our guys took off at the start before everyone else did. The referee called the race back and issued our 4+ a False Start. One more of those and we would be disqualified from the Final. All the boats were lined up again. Another boat false started. Everybody lined up for a third time. The race finally takes off. Our ML4+ rowed very aggressively off the line and were right in the middle of the pack. At the 1000M mark, the boys were in 4th place and threatening for a bronze medal. Places 2 – 5 in the race were all very close. In the final quarter of the race our young crew gave everything they had and ended up in 5th place. I am sure those men wanted a medal, but 5th place is one heck of an accomplishment. Well rowed! Next up was our Women’s Lightweight 4+ consisting of Jessie Rapoza, Josie Flohr, Rachel Taeubel, Jacqueline Taeubel, and coxswain Mary Ryan. The girls were just beginning to enter the course to get locked onto the starting platform when everything changed in an instant. Jacqueline was passing back the water bottles to Mary when she noticed that Mary was not responsive and having a serious medical issue. They immediately pulled bow first into the starting platform and yelled for someone to call 9-1-1. This caught almost everyone off guard for a moment and then the regatta referees sprung into action. One of the USRowing referees who was on the starting platform knew exactly what do and began to take care of Mary. We truly cannot thank Ruth Macnamara enough for what she did to help. She was incredible and knew exactly what to do. Over the next 30 minutes the unbelievable character and resiliency of the Long Beach Junior Crew family shined through. 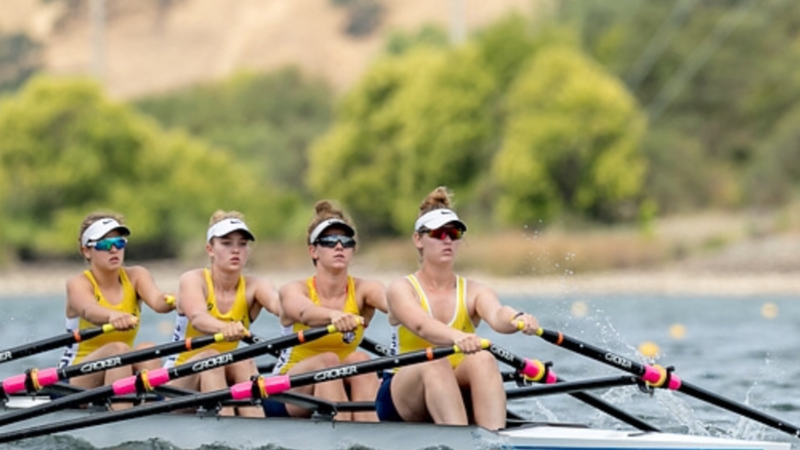 The girls in the LW4+ were ultimately the heroines of this story, but it would not have been possible without our entire team of parents, and athletes and coaches on both the men’s and women’s team. Parents at the starting platform ensured that Mary got to the ambulance and that one of them accompanied her to the ER. This allowed the coaches to figure out how to get our girls 4+ to row down the course despite being in really rough emotional shape. The Men’s lightweight 4+ has just finished their race and were waiting at the finish line to watch the Women’s lightweight 4+ final. Once the women’s coaches got a hold of the men’s coaches with some help from the parents, the boys 4+ was sent back down to the start to have their coxswain, Dillon, fill in for Mary. These boys had just rowed one of the hardest 2000m pieces of their lives and then turned right around without asking a question and rowed full blast back down the course. Once they were there, Dillon hopped in the coxswain seat and the girls told him their race plan. Let’s just take a moment to appreciate that TEAMWORK… Wow. Go LBJC. Now back to the girls. Your best friend has just been taken away in an ambulance and you are not sure if she is ok. You have been crying for about 30 minutes. Your national championship final race is in 3 minutes. I am pretty sure most people would either not race or simply paddle the course in honor of their fallen coxswain. Not these ladies. Within 3 minutes of Dillon hopping in the boat, they were locked onto the starting platform and the crews were being polled. Everyone still had tears in their eyes. They had decided that they weren’t just going down the course, but they were going to give it everything they had for Mary. No one can be expected to perform at 100% given these circumstances, but they were very close to it. They blasted off the start looking understandably shaken and a bit rocky, but after 500m they were in first place. Over the next 1000m, two crews had passed them and a third crew was about to pass them. Their dreams of a second national championship in the event were dashed and it was looking like they might not medal either. Instead of slipping back into 4th place, the girls roared to life in the last 500. With 10 strokes to go, they were not only in 3rd place but now only a half length down to 2nd place. The last 100m they went up again, even faster, surging ahead to earn a silver medal. It was a memorable race, and truly inspiring. That race took some real guts and showed a lot of heart and resilience. Amazing. Amidst all of the drama unfolding, our Women’s 4x raced their B final shortly after. The girls had an incredible start and fought hard all the way down the course. In the B final, we had CYC and Oakland Strokes who were medalists at Southwest Regionals just ahead of our girls. This was almost a repeat race from early may. While the W4x attacked all the way down the course and never let off the gas, the girls finished in 6th place. It never feels good to row behind other boats during your final race, but finishing 12th in the country is something to be proud of. 5 weeks ago the girls of the 4x were wondering if they were good enough to compete at nationals. I think they answered their own question. After the trailer was all packed up. The whole team headed to the hospital to visit Mary, where she was recovering. All in all it was a great trip to Sarasota, FL. Between the sing-alongs in the van, team dinners, escaping thunderstorms, and good hard fought racing, there was lots of team bonding going on. As a team we learned a lot on this trip, but most of all we were reminded how much we care about each other and how this team is willing to do whatever it takes for one another. 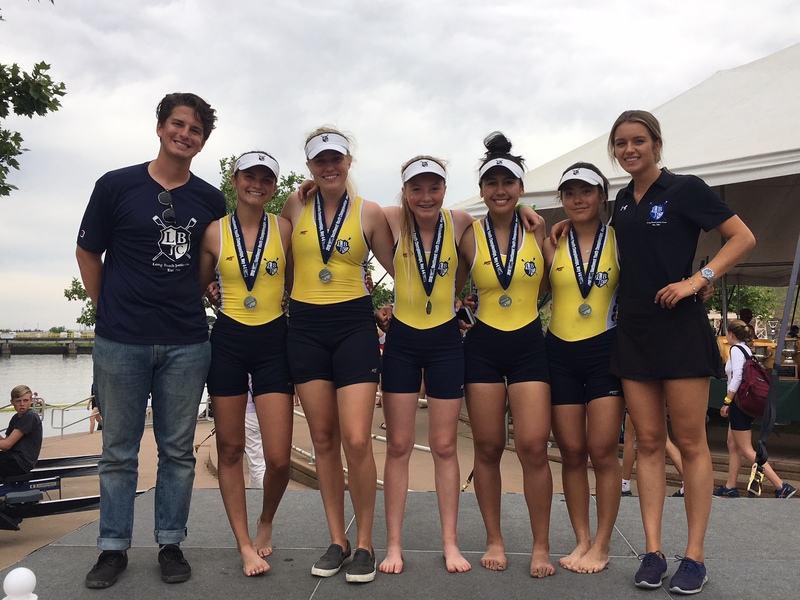 Long Beach Junior Crew wrapped up a successful weekend of racing in Sacramento on Sunday afternoon. 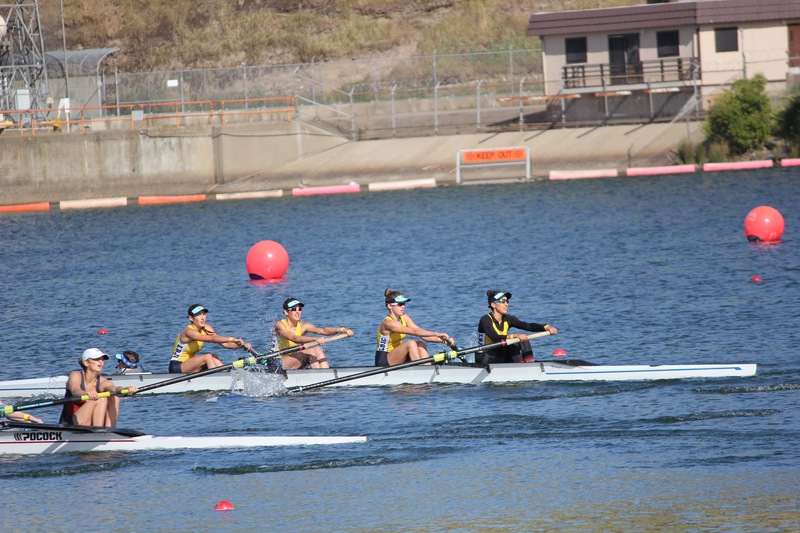 The Southwest Regional Junior Rowing Championships serves as a championship for Arizona, Utah, Colorado, New Mexico, Nevada, Hawaii and California. This is not only a championship regatta for all youth rowers, but it is also a qualifier for the National Championships. A top 3 finish in a Varsity event qualifies for the USRowing Youth National Championships in Sarasota, Florida in early June. It is hard to say that one boat in particular led the charge, because it truly was a full team effort over the weekend. Each of our four squads (novice and varsity, men and women) had excellent racing. As a club we won 3 Golds, 2 Silvers, and 1 Bronze. We also had 4(!) boats finish painfully close to the medals in 4th place. On Saturday afternoon, our novice women kicked off the medal haul with a commanding 7-second victory in the Women’s Novice 4x+ final. The girls made it look easy with their open water win. The future of sculling at LBJC looks promising! 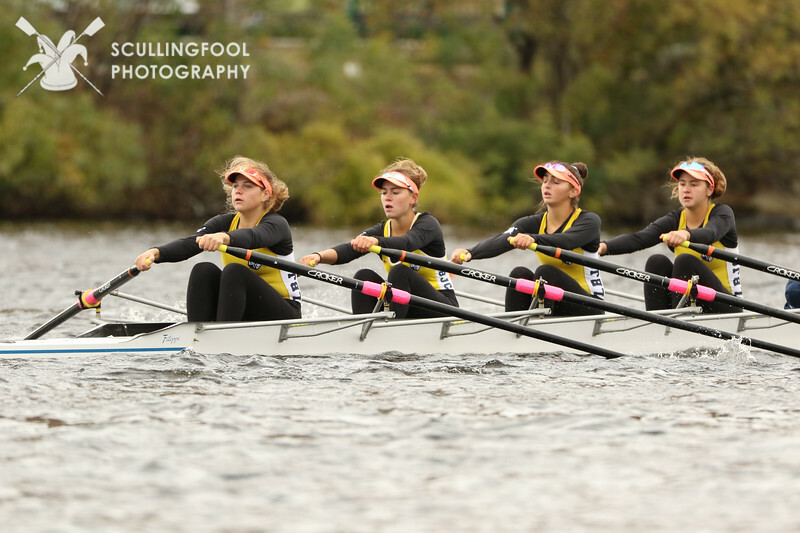 The next final was the Women’s Freshmen 8+, which is a mix of Varsity and Novice. Despite being a mixed boat, these girls looked as though they had been training together all season. The rowed well and finished in 4th place, 4 seconds out of 3rd place, in an impressive time of 7:14. There is no doubt that training together these girls will do some serious damage in the years to come. Not long after was the final of the Lightweight Women’s 2x. These cruised down the course in second place and at the 1500m mark, we were down 2.5 Lengths (7 seconds) to Redwood Scullers who were in first. In the last 500m our girls had an amazing sprint finishing only 1.7 seconds back and earning a silver medal and our first bid for Nationals. 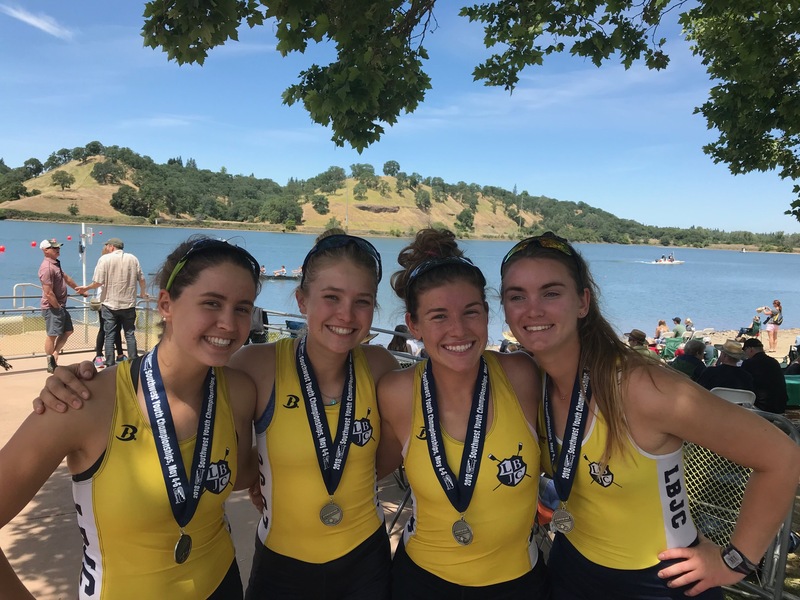 Next up was our Women’s Novice 4+, who battled down the course and earned a bronze medal, finishing 9 seconds ahead of the 4th, wrapping up a great season in that event. Determined not to let the girls have all the fun, the Men’s Novice 4x+ came down the course battling neck and neck with Redwood Scullers the whole race. With a “supreme” effort in the last 500m, our guys managed to get their bow ahead at the line- winning by 0.7 seconds. 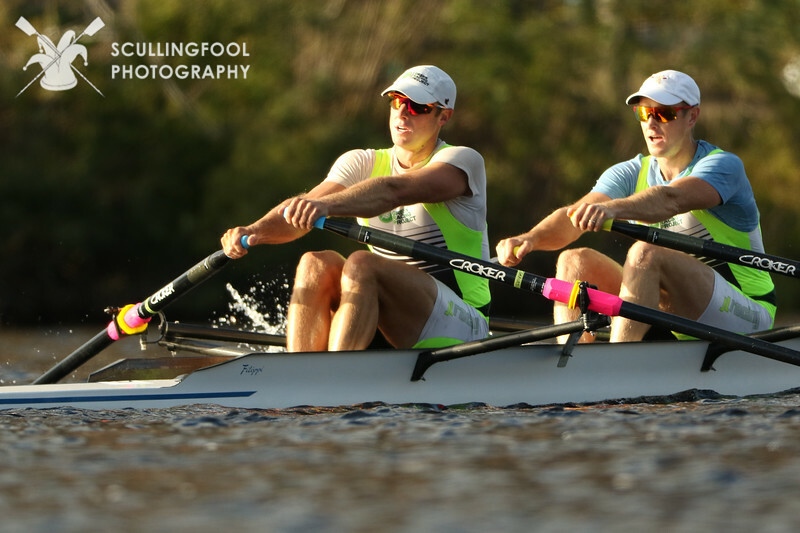 To cap off Saturday’s finals was the men’s lightweight 2x. 4 hours earlier the Francia brothers raced their heat. With 500m to go in the heat, they were sitting in 3rd and needed to place top 2 to make the final. The brothers had an epic sprint not only moving into qualifying position, but also winning the heat with the fastest time no less. Fast forward to the final: The brothers were in 4th place with 500m to go. They needed a top 3 finish to medal and qualify for nationals, making this almost the same situation as the heat. They had another amazing sprint, but as any good honeybee knows: you can only release your stinger once. 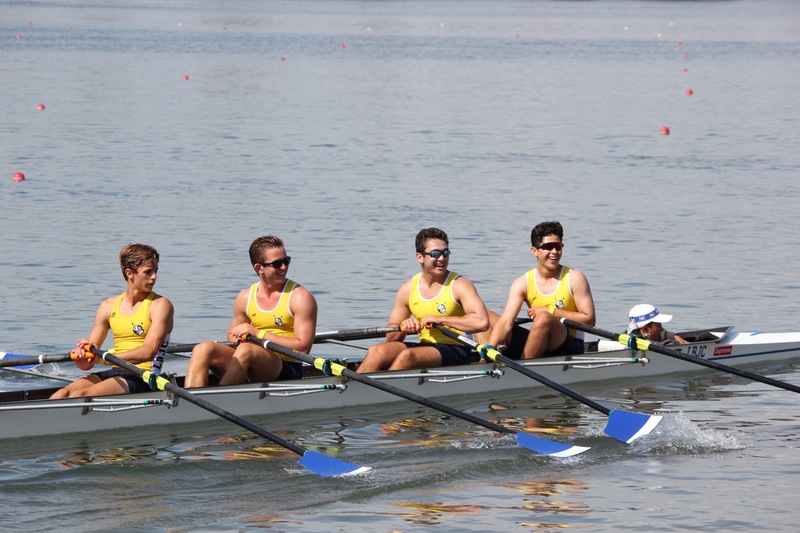 The guys rowed their hearts out and made another epic comeback but ended up missing third place by 0.2 seconds. Wow. What a day of racing. 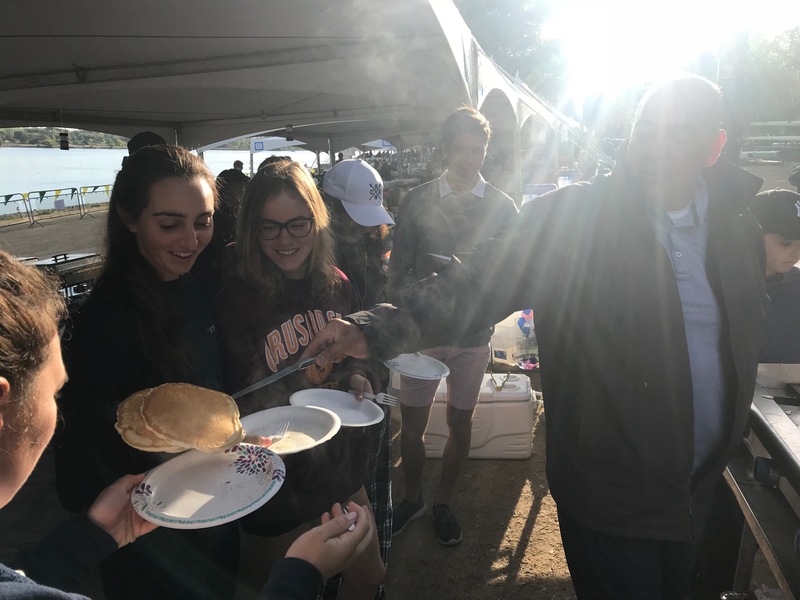 On Sunday morning before the National Anthem started Alfredo calmly stated, “You know Saturday was actually pretty good, but Sunday is usually the best for us.” First race of the day was the men’s lightweight 4+. The guys were battling for second place in the first half of the race while the leaders were a couple lengths out. In the second half of the race, our guys began reeling in Newport and left all others in their wake. They finished 4 seconds out of first in a fast time of 6:41 and clinched a bid for nationals. 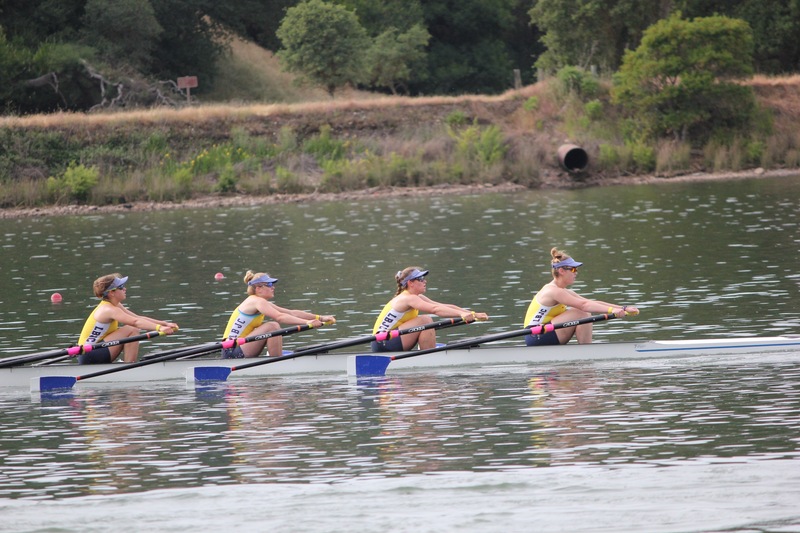 The next race was the Women’s Varsity 4x. Our girls had a very hard fought race. 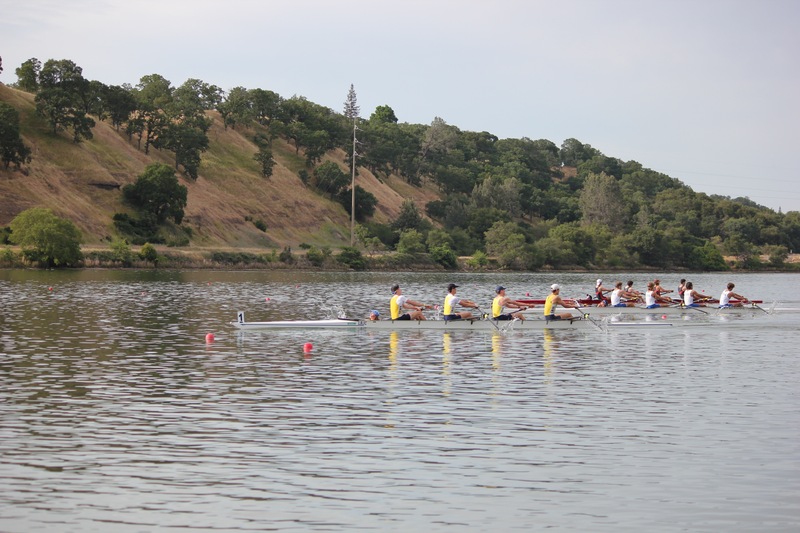 They truly pushed it to the limit battling Oakland and Redwood Scullers down the course. Unfortunately we came out on the wrong end of that fight and finished 1.8 seconds out of 3rd place, far ahead of the rest of the field. The next final was the Women’s Lightweight 4+, which turned out as expected: a two boat race for the lead between Marina and LBJC. Our girls had been beat by Marina earlier this season and were looking for revenge. Our 4+ was ahead off the start but the lead was slowly decreasing and at 1000m Marina over took Long Beach for the lead. The crews were going stroke for stroke nearly the entire race until the last 300m. Marina was ahead by about a deck when our girls erupted into a tremendous sprint and went from a ¼ Length down to ¾ of a Length up at the finish line. The girls first place finish means that we retain the “Alfredo Montenegro Trophy” and that they earned themselves another month of training for nationals. Next up was our Women’s Second Novice 8+. Our girls did well to make the final amongst some of the biggest programs in the country. The girls battled their way their way 5th place. Our women’s top Novice 8+ raced their final not long after. In a very competitive and tight field our girls finished in 6th place just behind Marin. The last final was our Women’s Lightweight 8+. They improved quite a bit after a line up switch from their heat earlier in the day but it was not enough for a medal. They finished in 4th place, 4 seconds out of the medals. Men’s Lightweight 4+ hunting in the final and qualifying for nationals. Women’s Lightweight 4+ sprinting into first place. All in all in was a fantastic regatta. We are incredibly proud of every rower and coxswain for their effort and commitment this season. Each one of our four squads finished with medals. Going over the results, it is truly amazing how many 4th place finishes we had. That should be motivation for next year. Our 6 medals could very well be 10 medals. While we don’t only judge our team’s success on how well we perform at regionals, it is the goal that allows us to perfect our daily process and gives our journey a destination. Next stop: Nationals. Go Beach! Thank you Parent Volunteers! The food was amazing! Our Spring Break Learn-to-Row Camp will take place from April 17 – 21, Monday through Friday from 8:00am – 12:30am. The camp is for kids 12 – 18 years old for beginners to intermediate level. No previous rowing experience is required! This is a fun opportunity to learn the basics of rowing and get out on the water in a single and team boats. We are pleased to announce that LBJC will have a 7th and 8th grade Junior High School Rowing Program in place starting Monday, February 20th. Practices will be Monday, Wednesday, Friday from 4pm – 6pm. To register, please download and fill out the registration packet below.